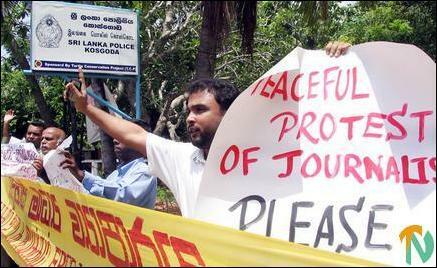 Journalists Wednesday thwarted an attempt to prevent them from holding a demonstration against Sri Lanka Police brutality in Kosgoda, a town in Sri Lanka’s southern coast. Several media organisations led by the Free Media Movement protested in front of the Kosgoda Police station Wednesday afternoon for brutally assaulting four journalists who were covering a public protest against the Police in the southern town last week. FMM media spokesman Mr. Sunanda Deshapriya shouting the slogans during the protest. Kosgoda Police blocked the Galle Road, the main highway from Colombo along the coast, at Elpitiya Junction, turning all traffic towards a detour, from around 11 a.m. to prevent journalists from reaching the Police station for the protest. 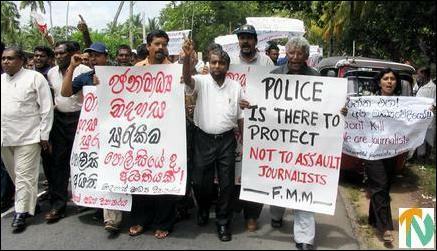 Police stopped a large group of journalists who went in a bus from Colombo for the protest. They refused to let the group through when the media personnel argued with them that they had no right to prevent journalists from going to Kosgoda town. The group of journalists then took a short detour and arrived at the Kosgoda Police station where they held a demonstration against the brutal Police attack on journalists and civilians last week. The media group and many local civilians also marched in protest in Kosgoda. Mr. Sunanda Deshapriya, FMM media spokesman and Mr. Shan Vijaylal de Silava, Chief Minister for the Southern Provincial Council with the protestors. Journalists protest out side the Kosgoda police station.